The number of bags found polluting shorelines fell steeply compared to 2017, according to the report. Legis. 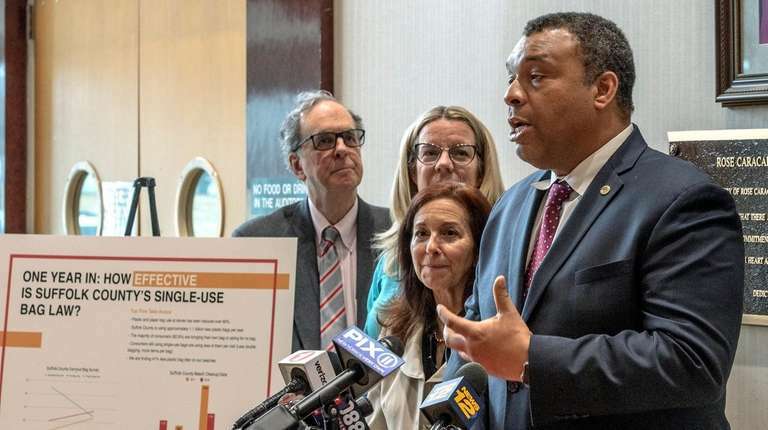 William Spencer and other local leaders present a new report on the effectiveness of the plastic bag-fee law at the Suffolk County legislature building in Haupauge on Thursday. Photo Credit: Newsday/J. Conrad Williams Jr. Some Suffolk County shoppers were outraged when a 5-cent fee on single-use plastic and paper bags went into effect in January 2018 but officials said the law is working as intended. Not only were 1.1 billion fewer plastic bags used in the county last year, but the number of bags found polluting shorelines fell steeply compared with 2017, according to a report on the law’s progress that was released Thursday. “So just think about that and what a difference it makes,” Legis. William Spencer (D-Centerport), who sponsored the bill, said Thursday. Spencer and other government officials, environmental advocates, and retail and education representatives attended a news conference at the legislature building in Hauppauge to present the report. On Jan. 1, 2018, the county law began requiring supermarkets, pharmacies, clothing stores and other retailers to charge customers 5 cents for each single-use plastic or paper bag they use to carry purchases. The law aims to boost reusable bag use and reduce the number of single-use plastic bags polluting waterways. Last year at stores in Suffolk, utilization of single-use plastic bags was down 81.7 percent and single-use paper bags was down 78.8 percent compared with 2017, according to the report, which cited data from the Food Industry Alliance of New York State, a trade group that represents the grocery industry. In addition, teams from the 5 & 5 Education and Effectiveness Working Group, which was created by the Suffolk Legislature to study the impact of the law, were stationed outside stores to analyze bag use before and after the law went into effect. Observing customers in November and December 2017 and in the two-month period in 2018, the teams found that use of reusable bags or no bags increased from 27.8 percent to 60.1 percent, according to the report. The report also showed that, between 2017 and 2018, there was a 42 percent decrease, to 1,552, in plastic bags that cleanup volunteers found littering Suffolk shorelines. The bag-fee legislation mandates that the county’s Department of Health Services prepare an annual recycling report by March 1 on the legislation’s progress, including information on any cost savings for the county from reductions in contaminated waterways and on the benefits of waste and litter reduction. Data on the cost savings associated with the law, however, was not in the report Thursday. Spencer said that the report would be forwarded to the budget review office to create a financial analysis, and he expected that to take a few weeks. The county does not receive any portion of the fees collected for bags. “Our objective is not to collect nickels. Our objective is to change public behavior,” said Adrienne Esposito, executive director of the Citizens Campaign for the Environment, an advocacy group based in Farmingdale. There are 21 cities, towns and villages in New York State that have enacted single-use bag fees or bans, including Long Beach and the Village of Sea Cliff in Nassau County, according to the Citizens Campaign for the Environment. New York City’s fee was blocked by Gov. Andrew M. Cuomo in 2017. Attempts to create a bag-fee law in Nassau County have not been successful. Nassau Legis. Debra Mulé (D-Freeport) sponsored a bag-fee bill in May that has stalled. Legis. Richard Nicolello (R-New Hyde Park), presiding officer of the Nassau Legislature, in the past has criticized the proposal as “a burden on taxpayers.” The GOP majority had no plans to schedule a public hearing or bring a bill to committee. Part of the objection to the proposal is that the bag fees don't go to environmental programs, said Frank Moroney, director of communications for the GOP majority. Also, the bill was held because a uniform statewide bill is pending, he said.